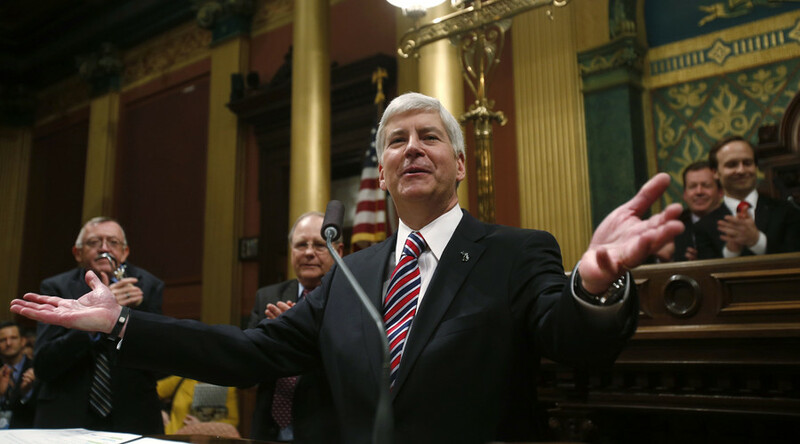 Be it lead-poisoned water in Flint or crumbling schools in Detroit, political blame is turning to Michigan Governor Rick Snyder (R), who has overseen the transfer of power from local governments to appointed emergency managers tasked with saving money. Governor Snyder has appointed seven emergency managers to cover various cities or schools facing financial disasters since 2011. While he isn’t the first governor to resort to such measures, his Democratic predecessor, Jennifer M. Granholm, appointed only five during her two terms. Snyder’s second term is scheduled to end in 2019. Emergency managers take over fiscal decisions concerning their assigned jurisdictions, often to the dismay of local residents or partially deposed politicians. After being forced to file for municipal bankruptcy in 2013, Detroit was lauded as a comeback story by many the following year. That is less the case now, however, as the city’s teachers have been engaging in unofficial strikes called “sick-outs” in anticipation of the school district running out of money this coming April. 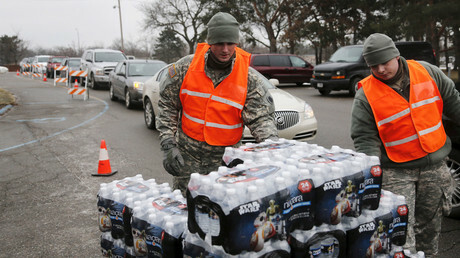 Meanwhile, Flint residents are clamoring for clean water. Both cities are under the direction of separate emergency managers. Many Michigan communities in the worst financial straits are predominantly black, such as Detroit with an 80 percent black population. This fact has led some to argue that race is a factor in determining which cities or areas are assigned emergency managers. “Tell me what race dominates in those communities that get emergency managers?” Hubert Yopp, mayor of Highland Park, told The New York Times. “People have a very real reason to question what that’s about. It would be one thing if the emergency managers worked with the local governments to make things better. But it’s about having dictator power in the city. The locals have no say,” Yopp added. Highland Park is 93 percent black and has also had an emergency manager in recent years. For others, it’s primarily an issue of control and failed governance. Benton Harbor is 89 percent black, and Muhammad called his city’s experience with emergency managers a “horrific experiment” that left the city saddled with lawsuits as a result of the fiscal decisions that they had made. As more details come to light, the political blame could narrow both in scope and reason, however. With new evidence detailing questionable decisions leading to the current crises, Snyder is unlikely to escape the crosshairs in a highly Democratic state. As it turns out, Darnell Earley, who is currently the emergency manager for Detroit schools, was once the emergency manager for the city of Flint. Earley left the latter position in January 2015, and another Snyder appointee, Jerry Ambrose, took over until the end of April. The Michigan chapter of the American Civil Liberties Union has unearthed court testimony from a case revolving around Flint’s public health, which shows Ambrose testified that another previous Flint emergency manager, Ed Kurtz, had consulted with the Michigan Department of Environmental Quality on changing the city’s water supply to the polluted Flint River. Kurtz rejected the idea in 2012, but then Earley did an about face in 2014. That letter contradicts talking points from Snyder’s office, where the repeated claim has been that DWSD terminated its service with Flint, forcing it to use the river. In fact, DWSD had only terminated the service contract in order to renegotiate terms. Former director of public works for Flint, Howard Croft, who resigned this past November, told the ACLU of Michigan that the Snyder administration was directly involved in the cost-cutting move to switch to the lead-ridden Flint River. Last week, Snyder released thousands of emails going back to the beginning of 2012. However, complaints over heavy redactions and the fact that the release didn’t go back to the beginning of his first term may be a preview of how the governor’s appeal to transparency won’t be enough to quell public discontent. Snyder’s style of governance has come into question not only due to his appointment of emergency managers, but also questionable cost-cutting measures, such as allowing state agencies to contract out work they would otherwise be responsible for managing themselves. Last year, the Michigan Department of Corrections paid out $250 million to fulfill 185 service contracts, ranging from counseling to food preparation for its prisoners. One of those private contractors, a food supplier called Aramark, finally ended up losing its business with the state, but only after thousands of complaints had gone ignored regarding maggot infestations, food shortages, drug smuggling, and sexual relationships among workers and inmates. A 30-person panel is currently being set up to oversee contracts before they’re signed onto by the department.